Walleye Madness Guide Service, Green Bay Walleye Charter. Guide and tournament angler Captain Steve Paulsen owns and operates one of Green Bays' premier guide services and is highly recommended by many anglers. Fish from a new Ranger 621 powered by a 250hp Mercury. Everything for fishing included (rods, reels, tackle, and live bait). Steve loves to teach people new techniques and how to catch monster Walleyes. Pack a lunch and let's go fishin'!! For a full 7 hour day of fishing. Fishing from 9 various locations depending on the time of the year and what area is most productive. We can fish from any location upon your request. Captain Steve Paulsen has been Walleye fishing the Green Bay for over 25 years. Experienced and knowledgeable, he has been very competitive fishing professional Walleye tournaments for years. Results: 4 First Place and 14 Top Ten finishes. 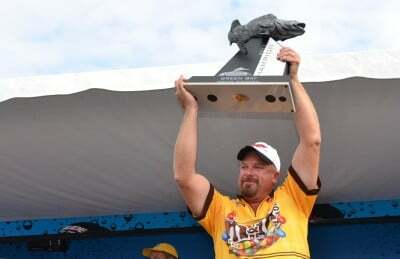 Winner of the 2011 FLW Walleye Tour in Oconto, Wi.